Why I can’t buy. Lio ion battery online in Canada? I searched some online stores like GearBest, banggood, AliExpress and wanted to order some 18650 batteries, however either shipping fees are unreasonable high or that order can not ship to canada, what’s happened? What is best way to buy 18650 lithium battery on line in canada? Due to extremely tight shipping restrictions, it’s very hard to order lithium-ion cells online. Check local vape shops I just purchased a Sony VTC6 today, they also stocked Samsung 30Q and Lg batteries. There are some vape shops in Canada that ship as well. Being from Canada I’ve encountered the same issue. Li ion batteries now require hard protective packaging, sturdy cardboard shipping boxes and specific large danger labels which for some reason China sellers aren’t willing to use. As others suggested, vape shops are your best bet locally but for the best price I use Amazon who has no issue meeting the shipping requirements. Same here. Amazon is listing and assuming shipping them to your house. Normally, they use postal service BUT…wh at I don’t know is if they are using local carriers, or they only ship to houses and not drop off centers. I haven’t actually bought any. I looked at EBL and had them on the last step of purchase before I changed my mind. Nothing special about shipping or any warnings. However….there may be an issue with shipping just batteries from US. I was rummaging through Amazon.com and I had a flashlight with a battery and one without, I think there was a warning or Can Not Ship on one. Just go Amazon.com and test it yourself. If you can’t ship raw li-ions then that would be a red flag that it can’t be shipped or potential problems. Probably comes under…if they don’t ask, I won’t tell. This is the only place i get my 18650 from, they were recommended to me by John “ Mooch”, a popular and professional lithium-ion battery tester for vapers. They have very good selection of cells at good prices, even with the exchange i get a quality cell at reasonable price. Usually i get my shipment within 10 days if the post people are working instead of striking. Have some cells that i used in my vape mods for a couple of years when i was vaping, and now use them in my flashlights,to me that speaks quality and durability of the cells is spot on. Some are 4 years old and and still work ok in the regular flashlights, when i put them in my BLFQ8 or MT09R i only get about 20 minutes instead of 120 minutes from a brand new cells. In my book that is quite acceptable. Been having the same gauntlet. 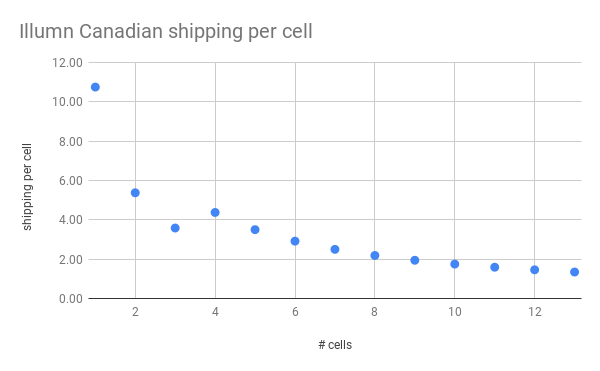 For a few cells, the shipping costs are disproportionate. Ilumn’s is $18 USD. The vape stores carry high current cells but not the higher capacity types. Their prices are high at $15 each (CDN). I’ve found Richard at MTN Electronics reasonable at $10 USD (shipping) but only 2 cells, afterwhich jumps to $17. Not as much selection but has the better cells for lights. It would seem that as Canadian carriers use passenger lines and as such refuse china shipped cells. The probable cause of fire would jeopardize human safety. But they accept cell phone batteries – and since the Samsung Note 8 misadventure, they should be more stringent. Perhaps there is different route with such cells, as land transport? Edit: for typical cells I did buy from PKCell. 2600 mAh and 5C discharge rates. They have Canadian warehouse, and you must check from which they ship. Else have extra fee. Re-edit(? ): NealsGadgets uses expedited shipping once in Canada – very reasonable rate. I ordered a special battery (26950) and awaiting their New Year finishes for processing. Doesn’t have the usual “This item cannot ship to your country” tag once completed the order. The worst thing is that cylindrical quality cells are safer than even cells in phones. Illumn’s shipping charge is quite reasonable per cell if you order more than a few. Certainly much cheaper than vape shops, which are the only real source in Canada. I like your graphical analysis. But my point was about a couple of cells. But a few, lets say 4 Sam’s 30Q @ $6 = 24 + 17 (shipping) = 41 USD. Thats $54 CDN or 13.50 / each. My local vape shop would sell me these at $12.50 each if purchased 4 (individually regular at $15). Not want to disprove anyone, but the cells are almost as expensive as the flashlight (Q8 going for $64 CDN). Thanks for you guys helpful messages. But my point was about a couple of cells. But a few, lets say 4 Sam’s 30Q @ $6 = 24 + 17 (shipping) = 41 USD. Thats $54 CDN or 13.50 / each. My local vape shop would sell me these at $12.50 each if purchased 4 (individually regular at $15). Not want to disprove anyone, but the cells are almost as expensive as the flashlight (Q8 going for $64 CDN). If buying within Canada, don’t forget to add HST, which adds another 13% or more to the price. Also, I’m a little more sure that illumn is selling genuine cells, than a local vape shop. That’s primarily because I can’t find dozens of positive reviews about a local vape shop, whereas illumn gets a lot of Internet business. The vape shops are hopefully selling genuine cells (certainly betters odds than off Amazon/e-bay/Chinese sellers). But, maybe they just bought them off Amazon? But, yeah, if I was only buying a couple of cells, illumn doesn’t make much sense. In that case, maybe I’d risk a new source. Forget about Canadian suppliers. What is the cheapest and most reliable source to get high end li-ion? I have to get over my concerns about paypal. The most reliable source I’ve ever used is Amazon. The product ships from Amazons fulfilment warehouse which is owned by Amazon and is prime eligible (2-day free shipping). They offer no questions asked returns/refunds/exchanges and they’ll cover all return shipping costs for refunds/exchanges. Also: if you return to Amazon: they send you the waybill for shipping and you typically have 30 days time limit for them to receive the return or at least confirmation it’s been shipped. I’ve many times returned something to Amazon about 18 days after I ordered and received the replacement. I’m also a vaper which means I did some pretty intensive research regarding batteries due to the potential catastrophic failure that can occur in a vape if used incorrectly. I found quite a bit of info on how frequently even vape shops will sell knock off batteries labelled as premium. Amazon is consistently less than any vape shop I’ve checked (at least a half dozen) but more expensive than BG or GB (which won’t ship to Canada). Amazon doesn’t however offer ANY button top batteries as from what I’ve read, these are modified in house by the seller which Amazon isn’t offering. I’ve also just placed an order over the CNY that hasn’t shipped yet from Nealsgadgest which didn’t restrict me from buying 4× 30Q button tops. Hope it ships! If not Amazon’s got your batteries. NEVER ORDER 18650s from Amazon! You could easily get counterfeit cells mixed in with the legitimate cells. LOL well I’ll have to buy them direct from Samsung then! ha ha in my research I found the exact same problem was likely to happen at vape stores, Chinese sellers, alixpress/baba etc. It looks like if my order is actually allowed to ship to Canada from Nealsgadgets, he’s going to be the #1 BLF recommended source! I actually know a few Chinese sellers on Aliexpress that I have 100% trust on to buy/put cells in gadgets. 1. Nealsgadgets. I’ve asked him about the shipping method, and he said he has a special shipping forwarder that ships legitimately lithium-ion cells without any problems. 2. Aliya’s battery Store and Lucky’s battery Store. They also use dedicated shipping services to North America for battery shipping to a USPS hub, and I haven’t had a problem with them. 3. Sofirn. If you ask nicely, they’ll put in their cells inside of their lights, which is very nice. Did Nealsgadgets sell the fake 40T's like Fireflies did or mention anything about them? Did Nealsgadgets sell the fake 40T’s like Fireflies did or mention anything about them? The seller is a Chinese PayPal account. Which would tell me the batteries come from China. The seller is a Chinese PayPal account. Yeah, but was Neil aware or did he happen to sell the fake 40T's and mention anything about it was what I was trying to find out. I'd rather hear from a decent outfit like Neil or Jack that they did something about it if that is the case than to file a paypal dispute personally. One thing I haven’t seen mentioned is what I’ve do — use a US parcel receiving service. If you live near the US border or don’t mind a weekend day trip to Niagara Falls or some such for some sightseeing and a quick trip across the border, then you can have US retailers send your package of cells to the parcel service. The service will call/email you when the package arrives, and you then go pay the receiving fee and pick up the package. It’s especially nice if you can take advantage of “free shipping within the US” deals, since you then just have to cough up a few bucks to the parcel service, and if your bill isn’t too outrageous, the nice Canadian customs officers will likely just roll their eyes at “flashlight batteries” and wave you through. Google “niagara falls parcel pickup” or whichever US border city you’ll be near, and you should get a nice list of parcel services. Obvious hint for Amazon US if you order a bunch of stuff: if it’s an option, choose fewer packages but possibly delayed delivery over quicker delivery but more packages, since you’ll be paying the parcel service per box received. My experience is that you get decent price but decent probability fakes trying to buy original mfr 18650s from Amazon. OK to buy branded Thrunite or Olight or the sort from Amazon but paying the brand rewrap premium in that case. Mtn Electronics has genuine stuff at a fair price, and you can use the credit card/paypal option where you do not need an actual Paypal account. I use this method but it can be pricey. Five to seven bucks each instance. They charge for receiving and holding. Ok for a 100 buck item but a waste for 10 buck items. Or cheap items, cheaper to risk the postal service and play the “get through” lottery. The place I use in Port Huron is US$3 (canamparcel.com). The first place listed when I Googled for Niagara Falls (247parcel.com) is also $3 for <35lbs, with 24-hour secure locker access, no less. If you’re getting charged a “holding fee”, I’d find a better place. For $10 items, no, I wouldn’t bother — but then I wouldn’t order $10 of stuff anywhere off the ‘net anyway since shipping will be so high of a percentage (well, except Chinese sites with free international shipping). Usually $10 items just get wishlisted until I have a decent order to put through. For items shipped free within the US, I usually just count the parcel pickup as the “shipping fee” — and for Amazon, just hope the bundle gets all packed into the same box. US$3 for US$35 or more of fulfilled-by-Amazon stuff shipped free to the parcel service seems okay to me — especially since I probably won’t have to pay tax on it, like I would if purchased locally or shipped from within Canada. Or shipped internationally into Canada, and then “randomly” chosen for inspection and customs fees and tax. Anyway, it may not be for everyone, but it did get me a load of 18650s from mtnelectronics.com a couple years ago, when I couldn’t find anyone in China to ship cells to Canada. I do it from the Niagara end. I will look into canamparcel. I’m really appreciatetive of your creative ways of finding a place to get your stuff to be shipped to. So my last order from Illumination Supply was $78.52usd for 12 Samsung 30Q plus a battery terminal protectors, that translated into about $105.15Cad at the time of the sale so that’s about $8.75Cad per battery. No need for a trip over the border or explaining myself to customs. Than again I am too lazy to drive to Buffalo so I pay more,however that is still a fair price in my book for an authentic Samsung 30Q.